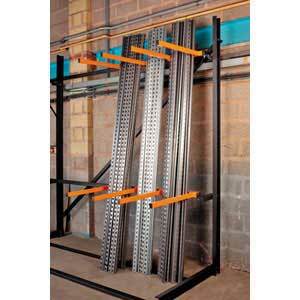 The vertical storage rack single sided extension bay is designed to be used in conjunction with vertical storage racks and is a great solution when additional storage space is required. These units are available with a design and installation service if required, so assembling them should not be a problem. The vertical storage rack single sided bay is normally used to store tall items and units can be purchased to store items of up to six metres in length. Typical items include lengths of timber, copper piping, metal tubes and plastic and steel. 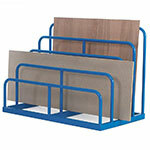 The vertical storage rack extension bay can be used with either the single or double sided racking. This extension bay is supplied complete with eight adjustable arms for each side. 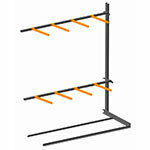 The units are able to hold up to 1,000kg/lm. It should be noted that the standard width of the bay is 3,000mm x 919mm to 1,481mm and the units are available in a variety of heights, ranging from 2,000mm to 5,000mm. This unit gives the storage flexibility needed for many workplaces and is ideal for the warehouse/manufacturing environment. Storing long or tall items is not always easy, but this unit has been designed to cope with exactly that problem; it is also a very cost effective solution.